It also used to be called "Ribbon Cream" on the box. Any idea what that meant? It was just white toothpaste. 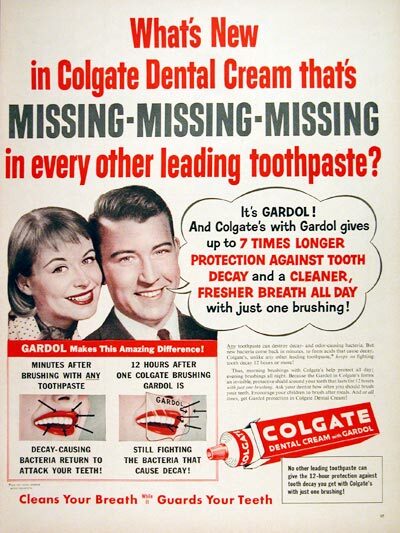 Gardol, created by Colgate-Palmolive-Peet in 1931 is sodium lauroyl sarcosinate. It was created as (and this is a quote from the original trademark form) an "antiseptic and germicide for use as a mouth wash, gargle, deodorant, nasal spray, or douche, and as a mitigant for offensive breath." As consumers over the years have become wary of chemicals, the folks at Colgate-Palmolive stopped using the term Gardol (the trademark lapsed in 1992) and it now goes by the name Advance White. I remember this! What the heck is gardol?